The headboard styles pictured below and on the next pages can be designed and custom-crafted for you in the sizes and colors of your choice. Tina welcomes commissions to custom build and custom weave headboards, matching end tables, and other furniture. Contact Tina directly to commission a custom-designed headboard. H 72" W 82" D 10"
The top of this king-size headboard is a dramatically twisting "wave" of thick bittersweet vine. The posts are maple tree, entwined in curling bittersweet vine. 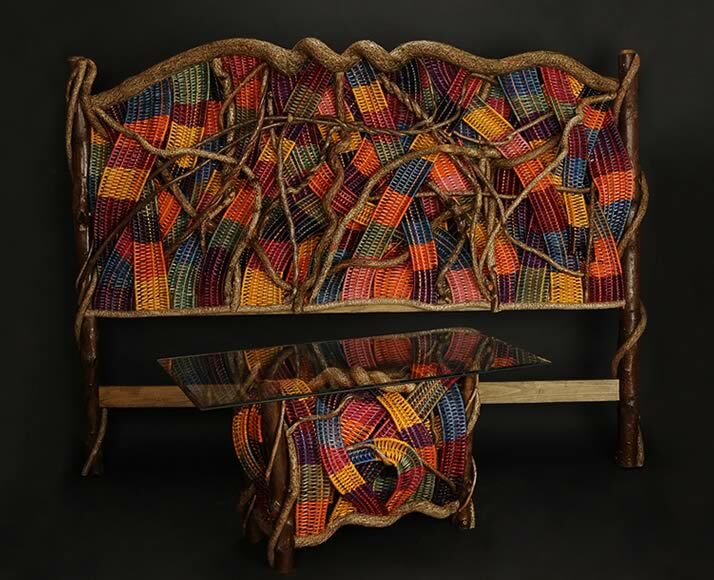 The backboard itself has been crafted from curving pieces of bittersweet vine interlaced with multiple woven panels made from brightly colored reeds with spokes of contrasting colors. View an enlargement of the construction detail of this headboard. View more construction detail. H 26" W 32" D 14"
The Perfect End Table was designed and constructed to be a perfect match to the Perfect Waves of Color headboard. The maple tree legs of the end table match the posts of the headboard. Large wavy pieces of bittersweet, proportional to the "wave" of bittersweet that graces the center top of the headboard, have been used to construct both the top and bottom frame of the end table. Brightly colored woven panels are interwoven with smartly curling pieces of bittersweet vine between the framework of the table's legs -- all brilliantly visible through the table's glass top. Price does not include the glass. View an enlargement of this table. View an enlargement of the construction detail of this end table. View more construction detail.